I can see from the trends in abortion on grounds of disability that the writing is on the wall for people like me. People with congenital disabilities are facing extinction. If we were animals, perhaps we might qualify for protection as an endangered species. But we are only human beings with disabilities, so we do not. Others argue that Shinkwin's bill would prevent parents from seeking abortion when there is "no realistic possibility of a pregnancy resulting in the baby surviving after birth." Even if you leave aside the moral debate about these situations, on a pragmatic level I see no reason why legislation couldn't be crafted to allow abortion in these extreme incompatible-with-life instances while prohibiting it for non-fatal disabilities such as Down syndrome. * Of course the lawmakers arguing against Shinkwin's bill don't address that. In fact, while explaining her opposition to Shinkwin's bill, Baroness Massey of Darwen specifically said "I shall not go into disability rights." Lord Shinkwin speaking about his bill to prohibit late-term abortion due to disabilities. When it comes to abortion in the case of disabilities, it continues to amaze me how many of my friends who traditionally fight for the rights and recognition of marginalized groups do an about face. It's a cop-out to only discuss the disabilities that result in extreme suffering and quick death for the child, while trying not to acknowledge the eugenic mentality that leads to aborting nearly all fetuses with Down syndrome. I try to remind myself that the fundamental difference between people of good will in the abortion debate is whether or not they recognize the fetus as a morally relevant human being. I imagine that many pro-choice people view abortion in the case of disabilities sort of how I would view destroying sperm that would result in disabilities. If you could know that sperm A would result in a child with disabilities and sperm B would result in a child without disabilities, and you chose to use sperm B for fertilization, what are the moral implications there? There are moral and ethical discussions about trying to create "designer babies," but those concerns are nowhere near the level of objection pro-lifers have about killing already-existing humans. I imagine pro-choicers who do not recognize the fetus as a morally relevant human would feel similarly about abortion in these cases. Even so, I find that mentality hard to accept. Currently parents can't confirm if their fetus has Down syndrome until after the first trimester, often as late as five months. It's one thing to believe that a blastocyst or early embryo is an irrelevant clump of cells, but to insist a fetus well into the 2nd trimester is equally irrelevant? We're talking about abortions near the stage where premature (wanted) babies go to the NICU. Ignoring the level of fetal development here requires a willful ignorance I find hard to forgive. 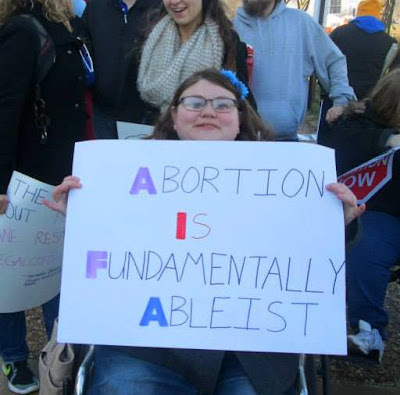 The most common example of the pro-choice movement’s ableism lies in many activists’ decision to call attention to 'fetal abnormalities,' particularly when explaining the necessity of legal later abortions. Abortion advocates frequently remind the public that such 'abnormalities'—conditions that could manifest as disabilities after a fetus is born—are usually not discovered until the 20-week mark of pregnancy or later. This strategy attempts to justify later abortions to anti-choicers by trading on the rhetoric that some abortions—of fetuses with 'abnormalities'—are inarguably necessary. Rather than reasoning that all abortions should be equally accessible no matter what, many pro-choice advocates lean on the argument that of course people, including anti-choicers, would opt out of having a disabled child if they had the means. Thus, later abortions should be legal. And this plan often does work. The text of HB 2, Texas’ aforementioned omnibus anti-abortion bill, explains that the 20-week ban does not apply to fetuses 'with severe fetal abnormalities.' The fetal abnormality exception has been publicly supported both by Wendy Davis and her gubernatorial opponent Greg Abbott, suggesting, again, that even anti-abortion politicians seem to relax their positions when confronted with the idea of a fetus with severe disabilities. But I have a problem with the idea that certain fetuses are more available for abortion because of their apparently disabled futures. When people who aren’t usually pro-choice (like most Texas legislators) start making exceptions for fetuses with 'abnormalities' in the same way that feminists do, I get nervous. I have to conclude that the rhetorical choice to justify abortion this way sacrifices the humanity of all people with disabilities on the altar of feminism. Lord Shinkwin and Rebecca are by no means the only people with disabilities who see the implications of pro-choice rhetoric about "fetal abnormalities." I just wish more able-bodied progressives would also take note. *Some states have worked to pass laws outlawing abortion for Down syndrome. Abortion advocates have responded "that by focusing on the diagnosis of a fetal condition, [such a law] edges toward recognizing the fetus as a person, setting up a conflict between the mother’s interests and those of the fetus."